When we think of a meal-time treat, roast beef with all the trimmings, or a tender, juicy steak would be high on the list for many Scots. Not only is beef one of the most versatile food products around, it’s tasty and nutritious, packed with iron and essential vitamins and minerals. And when it comes to choice for consumers, Scotch Beef is the gold standard in terms of quality, flavour and high production values. 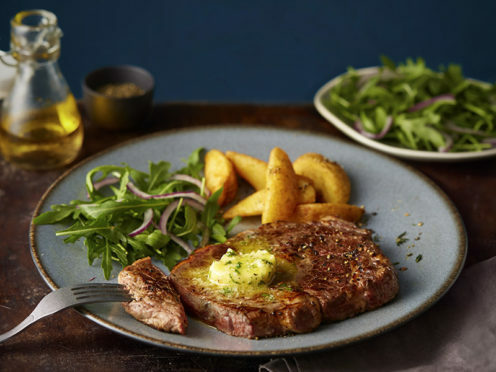 Scotch Beef has coveted Protected Geographical Indication (PGI) status, meaning it is sourced only from selected Scottish farms and all cattle are born, reared and processed in Scotland. So when you purchase Scotch Beef with the yellow PGI logo, you can be certain you are supporting local farmers and that the source of your food is entirely traceable. 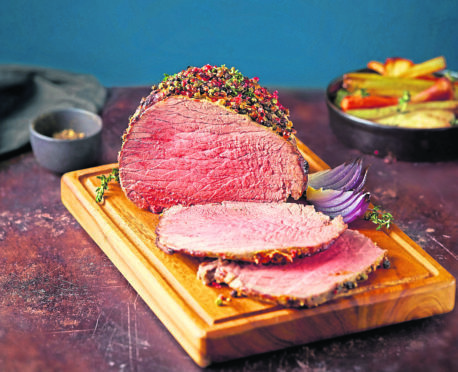 You can find a range of delicious Scotch Beef meal ideas at www.scotchkitchen.com and on Facebook by clicking here. Heat the oil in a frying pan and brown the meat and the onions. Transfer to a saucepan, then add the boiling water, Worcestershire sauce, pepper, bay leaf, tomato purée, and crumble over the stock cube. Now season with salt, and bring to the boil before covering and simmering for an hour. 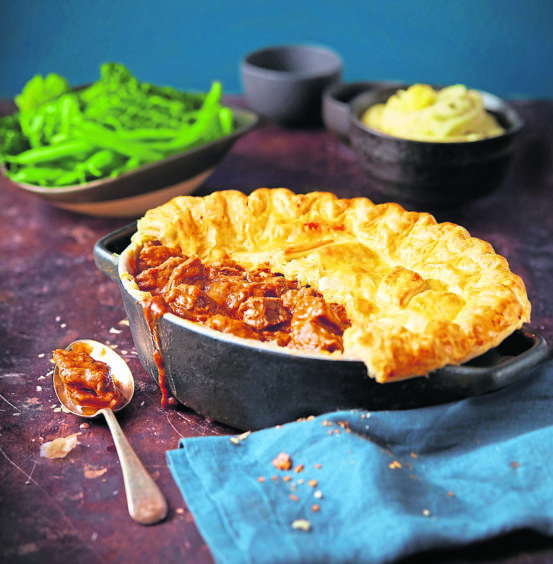 Preheat the oven to 200C, and put the meat and gravy juices into a 24-cm round pie dish. Unroll the pastry and trim to fit over the top of the dish, you can then use the trimmings to decorate the top. Using a pastry brush, glaze the top of the pie with the egg yolk and bake in the oven for 30 minutes until the pastry is golden. Preheat the oven to 220C. Grind the peppercorns in a mortar and pestle then, in a bowl, mix them with the mustard, oil and thyme, and season with sea salt. If you struggle to find green and red peppercorns, just use black. Put the beef in a tin, spread the peppercorn mix over the top, and arrange the onions around the sides. Now roast in the oven for 15 minutes before taking it out to remove the onions, keeping them to one side. Turn down the heat to 180C, and pour the stock around the roast. Cover the beef loosely with some tin foil (shiny side down), and roast in the oven for about 50 minutes for medium/rare, longer if you prefer well done. Once removed from the oven, cover the beef and let it rest for 20 minutes, and reheat the onions in the oven for five minutes. If you like gravy, you can use the cooking juices to make it. Serve the carved meat alongside the onions and vegetables of your choice.